So I finally have the equipment to do digital storytelling! Thanks to a generous donation from our Friends group, we were able to purchase a 70-inch flat screen TV and an Apple TV. As with the implementation of any new technology I had a few kinks to work out. 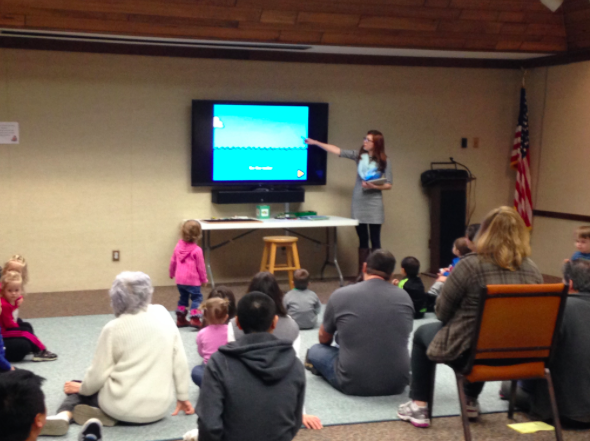 I practiced mirroring to the TV before I tried to use it in storytime and found that when the library was closed, everything worked perfectly! However, when the public was in the building, my apps ran really slow and stuttered. We have a staff only, password-protected wi-fi network and a public network. My guess was that the stuttering was due to congestion on the network (full disclosure – I’m not a tech person so excuse me if my conjecture is way off!). I was on the staff network and didn’t understand why I was having trouble. We have a fairly small staff and besides cell phones, the staff network doesn’t get used too much. After asking our network administrator some questions (and my husband who is a tech librarian! ), it seems that while it appears that we have two networks, it is really just one network that is split. So the heavy traffic on the public network may have caused my issues with stuttering. My solution was one that many Little eLit members have come to–using my phone as a personal hotspot. Everything works perfectly now! I should have just done that from the start. My solution was to use the Keynote app. I basically created a presentation in Keynote that had a black slide, followed by a slide with the lyrics to the song we sang, followed by a black slide, followed by a slide with images I planned to show during the storytime, followed by a black slide, and so on… I just went through the presentation as we completed each activity. So when I wasn’t using the screen, it was black and everyone’s attention was on me. I think Tim Gunn would be proud of me–I made it work–but if anyone knows how I can get the iPad to stay connected to my personal hotspot even when it’s closed, I would love to hear it! 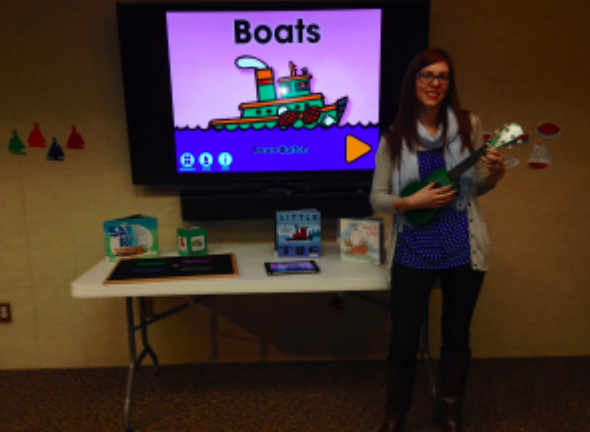 Check out my blog, Anne’s Library Life, for a full outline of my Boat themed digital storytime. Posted on April 2, 2014, in Apps, Story Time and tagged Anne Hicks. Bookmark the permalink. Leave a comment.